The core technology advantage of large commercial concrete mixing plant is reasonable product cost, stable performance, the overall appearance of the structure. The rooftop has a large capacity of sand, stone silos, from metering to stir the materials; the entire concrete production is in a completely closed environment, which has an outstanding performance in the green. 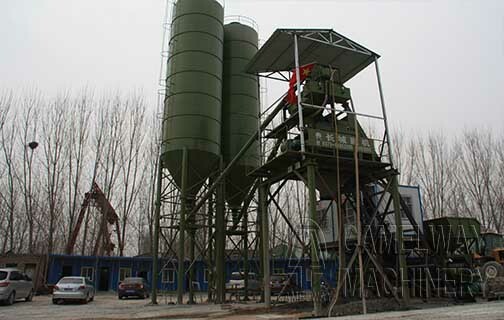 The commercial concrete mixing plant is applicable to the commercial concrete construction of large-scale projects and cement components products manufacturing concrete focus stirring places. As a professional concrete batching plant producer, Zhengzhou CamelWay Machinery has produced concrete batching equipment which can satisfy your different requirements. For example, tower cranes, construction elevators, concrete mixing stations, JS concrete mixers, concrete batching machines, stabilized soil mixing stations, wheel loaders, concrete transport tanks, JZC concrete mixers and other construction machinery. If you are interested in the concrete mixing equipment, please feel free to contact us.